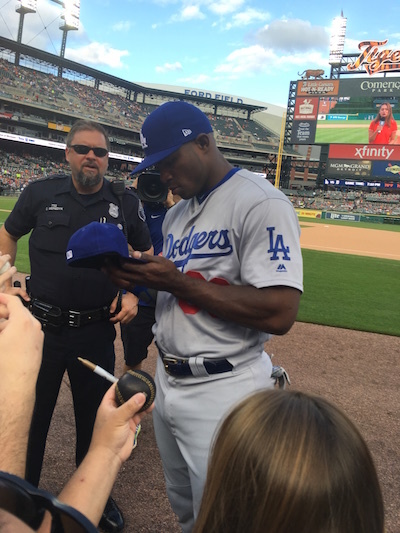 Lance Martinez from My Detroit Sports provided this photo of Dodgers outfielder Yasiel Puig signing autographs, prior to a recent game at the Tigers home stadium of Comerica Park in Detroit. Puig has had a very interesting tenure with the Dodgers, since joining the club in 2013. That season, his play and flamboyant style sparked the team to a playoff appearance, while he finished second in NL Rookie of the Year voting. The next few years have been up and down for Puig, with hamstring injuries and clashes with teammates, coaches and the front office often derailing his incredible talent. Over the past couple seasons, the Cuba native spent time on both the DL and LA’s Triple-A affiliate in Oklahoma City. The team considered releasing him, but decided in the end to retain the now 26-year-old. 2017 has been a great regular season for Puig and the Dodgers. Puig is having his best campaign, with 26 home runs and 69 RBI (entering Monday) for the first place Dodgers. LA certainly has a great chance to finally get back to and win their first World Series since 1988. Fans can check out a previous look at Puig signing autographs, via this link.